It’s that time of year again. The road and track season is drawing to a close. Yes, a few of the athletes I coach still have important events left in 2012. Max Korus and Bobby Stumpf are racing the Bucks County Classic this weekend. Robin Carpenter is racing the Mayor’s Cup in Boston next weekend. Francois Parisien, after his remarkable 10th place finish (first North American) at the Quebec ProTour race on Friday may very well be headed to Limburg, Netherlands for World Championships (pending selection for the Canadian National team of course). And yes, for those focusing on cyclocross the season is just beginning, with the first 2 MAC races being held this weekend in T-Town. For most riders though, it is the end of long season. I usually recommend that riders take some time off the bike, do some cross training, indulge in some of the things they deny themselves the rest of the year, and use this time off to get some perspective on the past season. With that perspective athletes are better able to assess themselves along with their biggest successes and failures. Although training is limited in this “Transitional Period”, it is, in my opinion, the most important time of the year to have a coach. Someone who can help you see yourself as you really are and help you identify what went well and what didn’t go so well. I could go on and on but I think you get the point. Cycling, at least at a high level, like many other sports, is more about mentality than physical capacity and conditioning. Now let me be clear: physical capacity and conditioning are important. You won’t find many riders in the Tour with a VO2 Max below 50 L/min/kg and you won’t find many that train less than 10 hours per week on average. But talent and training can only open the door. Athletes have to have the right mindset to walk through it. Having the mental capacity to be successful at the highest levels of this sport isn’t simply about having “the will to win”. I make the assumption that all competitors want to win. They wouldn’t be there if they didn’t. But cycling takes a strange and unusual combination of mental qualities. To put it simply, a successful cyclist must be exceptionally humble and exceptionally confident: two qualities that are seemingly opposed. So yes, in many ways the successful cyclist is a paradox wrapped in an enigma… maybe there’s a riddle and a mystery involved too. 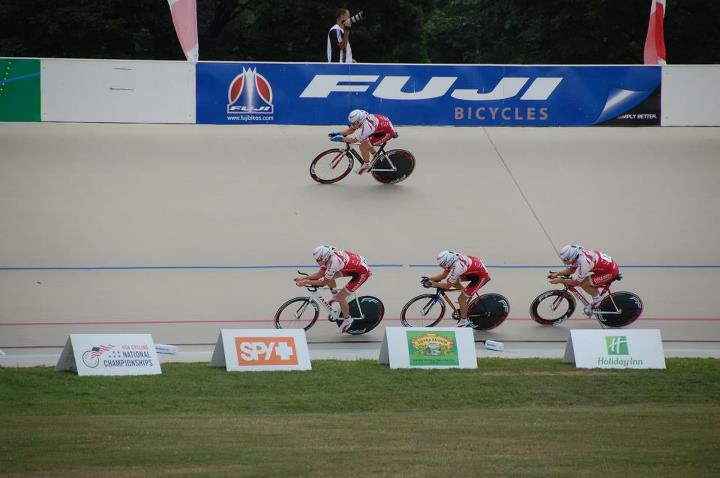 The Young Medalist Team Pursuit squad finished in 3rd place at 2012 Junior Track National Championships behind 2 Garmin squads. Exceptional confidence, at least in the context of a bike race, means that an athlete is able to go into any race no matter high the level of competition with the mindset “I can win this” and “I deserve to win this”. There is no doubt that when you think a race is yours to lose you race harder and smarter than if you count yourself out from the start. Of course, having confidence doesn’t mean that you don’t respect your competition, it means that you force your competitors to respect you. You do that by showing them that you are going to fight and not just lay down and die. You can’t control whether or not you are ste strongest rider, but you can control whether or not you will be the one that fights the hardest. And then there is luck; something else you can’t control. In any given race you are bound to have some things not go your way. In some, it seems like nothing goes your way. Crashes, flat tires, bad weather… you can’t control these things. What you can control is whether or not you will let them define you. This is where the extreme humility comes in. Although you have to have confidence in the face of overwhelming odds you also have to face the reality that you won’t win most of the time. It’s not just a matter of not winning most races either. On a day to day basis, training itself can be extremely demoralizing. Fitness doesn’t follow a nice linear path of improvement. Sometimes you take 1 step backwards before you take two steps forwards. Sometimes you take 1 step backwards, 1.0001 step forwards. Sometimes you take one step backwards and then you crash or get sick or you have a big project at work or you have to pull an all-nighter for school and you never take a step forwards because you can’t recover. In any case, real progress is slow. Sometimes it feels like you spend all your time, money and energy and your reward is getting kicked in the balls. Humility is about having the patience and faith to keep going even when things don’t go your way (sometimes for very very long periods of time). Having this special combination of confidence and humility means that you start every race saying you can win, but when it doesn’t happen (which it won’t most of the time), you don’t let yourself get down about it. You just keep going. The trouble is that most people have a little too much on either the confidence side or the humility side. Without the humility to balance it out, confidence easily slips into over-confidence and arrogance. Saying “I can win this” is not the same thing as saying “I will win this” or even “I am the best rider here”. Athletes that are all confidence and no humility are inevitably disappointed. We must remind ourselves that even the best riders in the history of cycling lost a lot more races than they won. Yet this is exactly why confidence is so important. With such overwhelming odds against you, why even bother? Because even though most don’t win, someone always does win. So why can’t it be you? I never stopped getting nervous when I saw high caliber riders on the line with me; I just realized that I can beat them. Certainly not all of the time. Probably not most of the time. But I know that I always have a shot and I will do everything in my power to take advantage of it. And at the end of the day if it doesn’t work out, I will go home, get back to my training plan, and then get ready to try again next race. Colin Sandberg is the owner and head coach of Backbone Performance, LLC. He is a Cat. 1 road racer, a USA Cycling Level II coach and a UCI Director Sportif. He also is head coach at Young Medalists High Performance and race director for Young Medalists/Team Rothrock. If you are interested in coaching or if you want to find out more, check out Backbone Performance at www.BackbonePerformance.com or like us on Facebook at http://www.facebook.com/BackbonePerformance. Thanks for reading!